What to put in your Instagram bio link takes on critical importance given that you can’t put clickable links in Instagram posts. So here some pointers on making the most from the one clickable link you have. What? Instagram only gives me one link in my bio? Yes, that’s true. You get one clickable link in your bio. Although once you have more than 10,000 followers, in Stories, you can send viewers elsewhere with the ‘swipe up’ option. The default place to send people in your Instagram bio is to your website home page. But that isn’t always relevant to what you’re’ writing in your captions. You might be promoting a special offer one day, a blog post another and a new product on the third. 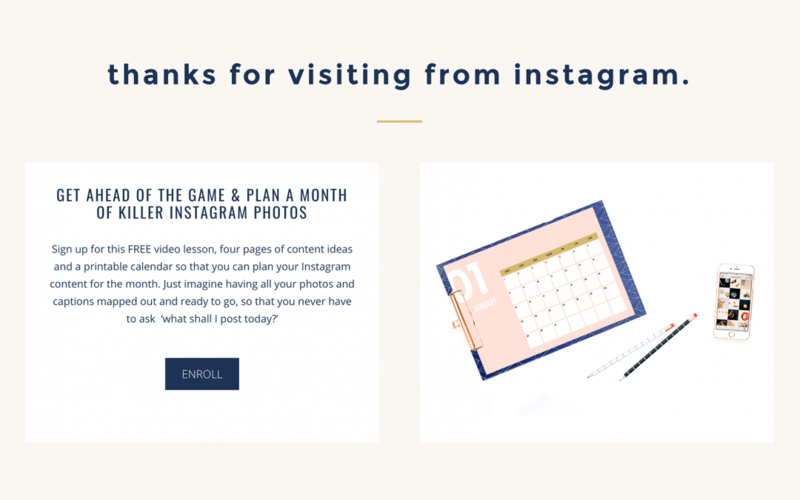 To make things easy for your readers, you want to link directly to the relevant place they should go if they’re clicking through from Instagram. One option is to keep changing the link in your Instagram bio to suit your latest photo. Yay – sorted! If a reader clicks on an old post and wants the relevant link for that, what happens? Epic fail, that’s what. You have multiple ways of making the most of your Instagram bio link which include paid and free services and DIY. All of them essentially give you a page to link to which contains multiple links. Linktree is a service that provides a web page with all your relevant links. It has free and paid options, with the paid options giving you more choice over styling. On the plus side, it is relatively easy to set up and you can add your Facebook Pixel ID for retargeting. On the down side, visitors are not going to your website and the layout is fixed. Lnk.bio is a similar service designed to run multiple accounts. It also has free and paid options. Like options one and two, but with photos, Link in Profile is easy for visitors to find the link they want. This offers a free trial. Tap.bio offers a swipe-through option that looks like Instagram Stories. It has free and paid options. This is the option I’ve chosen, for all of the above reasons. And if for any reason, the visitor can’t find what they’re looking for, they’re on my website, so can browse the menu and search. If you want to have a look at what I built for my Instagram bio – here’s the page. Top tip: if you’re referring to the link in your bio in your caption, put your own Instagram handle there, such as @livingabstracts, so that readers can click on that to go straight through to your bio. Many of your caption’s readers will be scrolling through hashtag feeds or their home feeds and adding this link makes it easier to get to your bio than scrolling up a little and clicking on your user name.